Product Categories: Sound Reinforcement System. Anthony James Partners designs a new system for University Stadium with Jericho Horn J3 point source loudspeakers and BC-218 subwoofers. The University of New Mexico football team, the Lobos, plays all of its home games at University Stadium on the school’s south campus in Albuquerque. Erected in 1960, University Stadium underwent several expansions that brought its current seating capacity to just shy of 40,000. Recently, the school replaced its former south end zone scoreboard with a new Daktronics LED scoreboard in the north end zone, opting to include two Danley Sound Labs’ Jericho Horn J3 point source loudspeakers supported by two Danley BC-218 subwoofers, with power from Danley’s new DNA-Series of DSP-enabled amplifiers. “These days, a great sound reinforcement system is the twelfth man on the field for the home team,” said Larry Lucas, director of audio and broadcast engineering at Anthony James Partners and the designer of University Stadium’s new sound reinforcement system. The system design is straightforward. A point-source Danley Jericho Horn J3 flanks either side of the north end zone scoreboard to cover the east and west sides of the stadium, as well as the stands beyond the south end zone. Four smaller Danley SH-46 full-range loudspeakers hang from the bottom of the scoreboard for front fill, and a single Danley SH-96HO loudspeaker fires from a low angle across the field for on-field coverage. “The team is really happy about the great on-field sound,” Lucas said. “It’s good for the players and great for team morale.” Because Lucas purposely kept the Jericho Horns’ tight beams from including an athletics facility adjacent to the south end zone, he also included a handful of fully-weatherized Danley OS-80 loudspeakers to cover seats near that facility. Rather than split the two Danley BC-218 subwoofers to parallel the Jericho Horn placement, Lucas placed both subwoofers on the west side of the scoreboard. Inputs to the system include a new Denon DN-300Z combination media player with CD, USB, and SD card inputs, an AM/FM tuner, Bluetooth connectivity, and a 1/8-inch jack, along with a new collection of Lectrosonics wireless handheld microphones and a Click Effects ProAudio audio clip player. A Yamaha 01v96 digital console collects all the inputs and serves as user control for the system. From there, signal flows to a QSC Q-SYS DSP system, which primarily handles input conditioning and routing logic. Three Danley DNA 20K4 Pro amplifiers and three Danley DNA 10K4 Pro amplifiers provide a total of twenty-four amplifier channels, each supported by integrated loudspeaker conditioning DSP. When Bob Davie was hired to take over the Lobo football program after the 2011 season, he was tasked with changing things up … the product on the field, the student-athletes in the community, and in the classroom. He has done just that, improving UNM’s wins 400%, having his student-athletes constantly giving back in the community, and nearly doubling the number of Academic All-Conference selections. For the fans of UNM football, the change is noticeable and dramatic. But while all of those changes were going on surrounding the culture of Lobo football, there were changes for the players and fans inside and around Lobo football in the form of major stadium enhancements and upgrades. In 2012, UNM received a brand new FieldTurf playing surface, considered by players and coaches as one of the best in the NCAA. In 2013, University Stadium saw the largest scoreboard in the Mountain West installed behind the North end zone and in 2014, a state of the art Athletic Performance Center was opened, giving UNM’s team access to the best in strength, conditioning and athletic performance. In 2015, in time for UNM’s annual Rio Grande Rivalry game with New Mexico State, the latest enhancement to University Stadium will debut, and to Lobo fans, it will be music to their ears. Literally. UNM has partnered with Daktronics of Brookings, South Dakota, to install a new full-range audio system at University Stadium. Installation has been ongoing since UNM’s last home game with Tulsa University, and all systems point towards go for its debut on October 3. Anthony James Partners (AJP) was proud to partner with UNM to help design, procure and manage the construction oversight for the new sound reinforcement system at University Stadium. 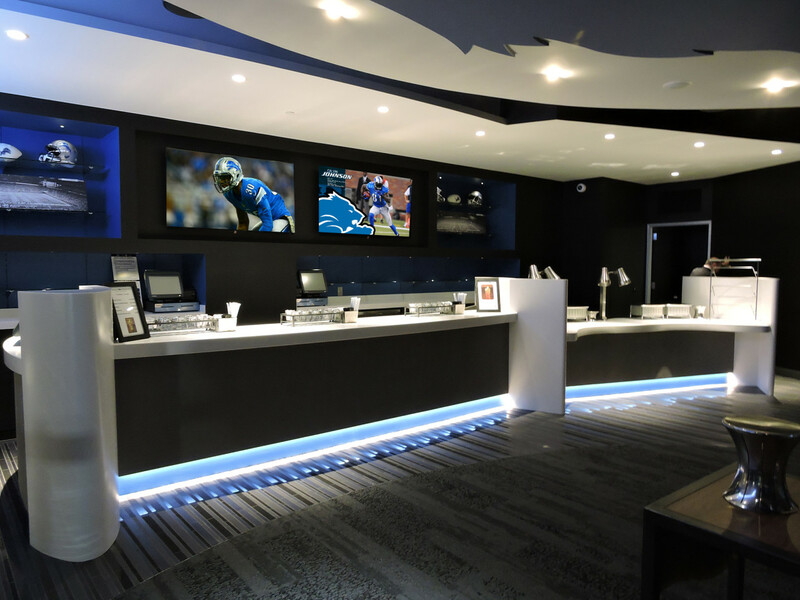 AJP is an Owners’ Representative that provides A/V and strategic business consulting as it relates to technology. Combined backgrounds in technology, design, procurement, venue operations and construction create efficiencies in their process and give AJP unique insight when approaching large projects such as this. 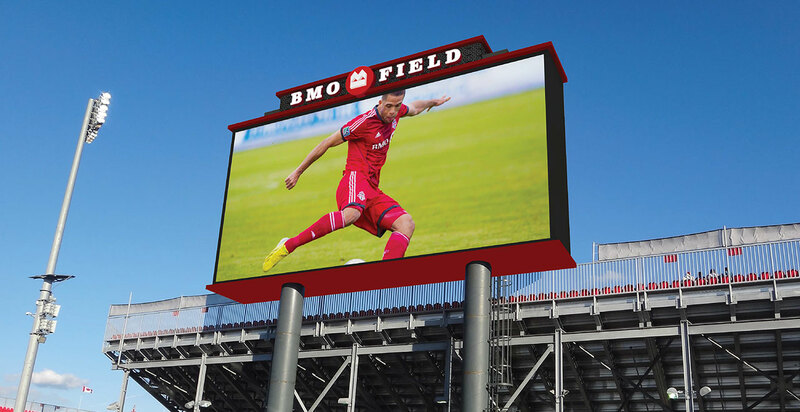 The new top-of-the-line, custom Daktronics audio system will be integrated into the existing video and scoring system for maximum effectiveness at every event. 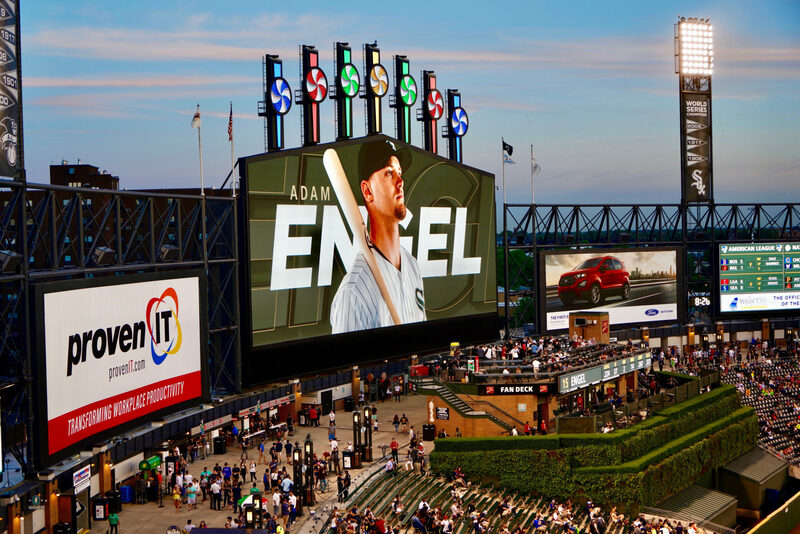 The system consists of 13 total Danley Sound Labs speakers mounted in two clusters in vertical cabinets, one on each end of the scoreboard and driven by 40,000 watts of power. In phase two of the project slated for later this season, Daktronics will also replace all club level and press box suite speakers and provide a new digital audio console, all in the name of enhancing the fan experience. These audio upgrades will provide clear, intelligible speech and a powerful audio experience for Lobos fans throughout the stadium. Sound plays a unique role in the game day experience, and having a new sound system that is completely compatible, and completely integrated with the video board will only enhance many of UNM’s in-game features such as the New Mexico Man, video board promotions, and of course, the music.